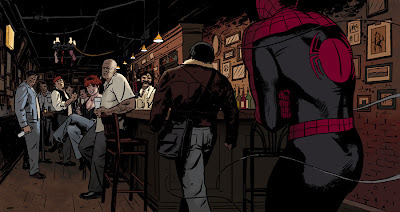 So Spider-Man and Wolverine walk into a bar... hilarity ensues. This Wednesday, The Amazing Spider-Man: Extra! #2 will hit comic book shelves across the country. Zeb Wells and I have an 18 page back-up story that I hope you'll enjoy. It's my first crack at coloring interiors and, hopefully, not my last. I feel like I haven't gotten much artwork done since this issue... a whole lotta writing lectures, doing sketches, and running errands. I'm still getting the Red Sonja Step by Step feature organized as well. The good news is I'm focusing on painting for the next month or so, about 6 covers in all, a couple of which are my new favorites. And a couple that may garner some publicity. We shall see. I'll show as soon as Marvel will let me. Later this week, I'll be heading back to RISD as a visiting critic. My colleague (and roommate), R. Kikuo Johnson, is teaching a comics class this wintersession and invited me to join him. I can't wait. 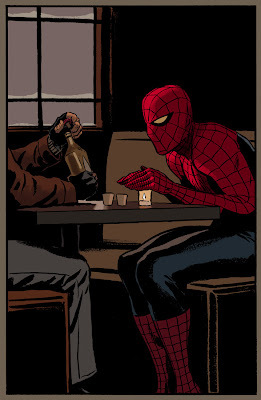 I really think that Marvel and whoever else lets you color your own work from now on. It's great, seriously. I enjoy the way you color everything, how you got the shadows and all look extremely well. Plus, how great would it be to color your own work? We should setup a "Have Paolo Color His Own Stuff" petition to send off to Marvel. Maybe they'll print it in the letters column. I think I'll be able to color everything from now on. 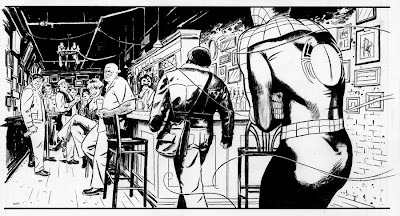 The only reason I didn't color the Punisher story is because I didn't have time. But now with my assistant's help, I can color pretty quickly. Thanks for the vote of confidence, though! Kudos to you and Reid for doing the Wintersession course, Paolo. Please say "hi" to Nick Jainschigg for me and the Hubs if you run into him. You have an assistant now? That's pretty sweet. What's the punishment for unsatisfactory or insolent behavior? Will do, Christina (although Reid says the regulars aren't around as much during wintersession). My assistant was previously my unpaid intern. It's great: I just send him bitmaps and he sends me back colored images. I'll let you know if he's ever insolent. Can you color my stuff? You know I'd love to, Paul... but you'd have to come back to Marvel!